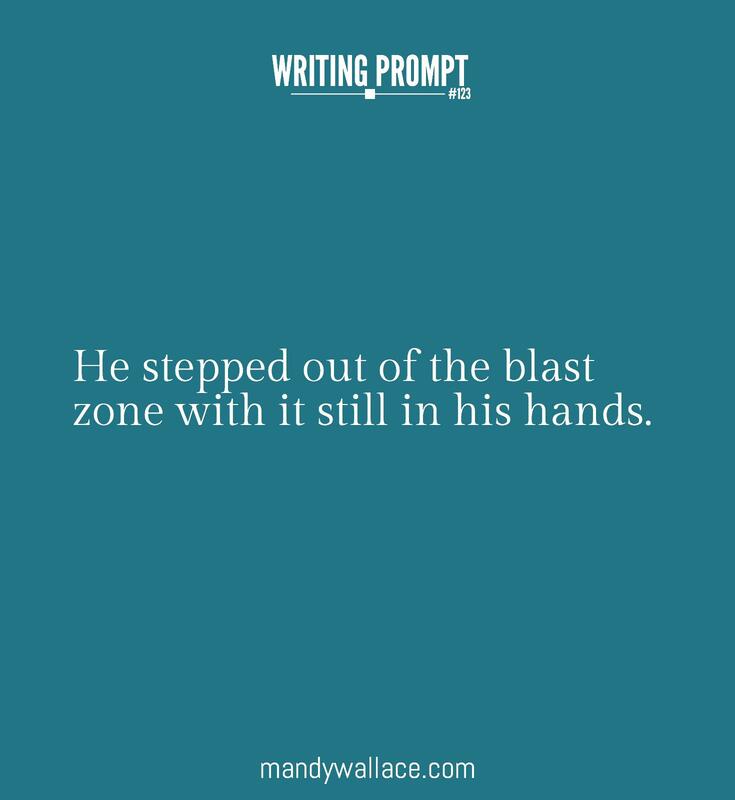 He stepped out of the blast zone with it still in his hands. Consider the prompt for five minutes. Who is the protagonist? Why was there an explosion? What’s in his hands? Write with abandon for fifteen minutes. With this prompt, you get complete license to go wherever crazy place the story takes you. I am wondering how you put together these Writing Prompts? Thanks! That’s a good question, Charity. I make up the prompt. Then I design the image using either Piktochart or Picmonkey. Hope that answers it. The bloody dagger still in my hands, I rush to the corner of the street, hoping to be barricaded enough to survive another fifteen minutes. Suddenly, I feel a blast of warmth and pressure on my entire left side. I get up and turn my head to see that entire road, including the cars, trucks, and buildings, is erupting in flames. My eyes instinctively widen and I step out of the blast zone with the dagger rushing along at my side. The cold steel of his now dead buddy’s dog tags. Raising his hands to his eyes as if to see through the thick cloud of smoke, he staggered forward several steps then fell to his knees. Thanks for jumping in, Lois. Nice! “Jones!” Fritz yelled above the whirring of machinery and the shouts of the others. “This baby’s going down hot, I’m gonna need that backup right about now!” Jones was gasping for air, sweaty hands clutching the stairway. They stumbled past the smudged chalk line, leaning on each other’s shoulders for support as Jones coughed up blood. Fritz grinned. If everything went according to plan, today’s battle would be another success. The detonator had some blood on it, so he wiped it off with a just-as-dirty finger. Lots of dynamism and action, Megan! Thanks for your bravery and for sharing your writing with us <3 Beautifully done. Thanks! I was pretty satisfied with how it turned out, although the last part was a little rough. I love your writing prompts, by the way-they really spark the mind’s creativity. This scene just popped into my head!